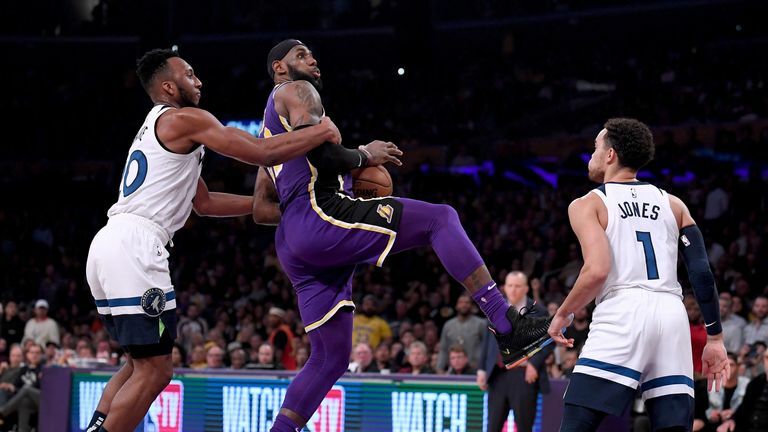 LeBron James scored 24 points, and Kyle Kuzma and Josh Hart had 21 apiece as the Los Angeles Lakers held on in a back-and-forth affair to earn a 114-110 victory over the visiting Minnesota Timberwolves on Wednesday night. James added 10 rebounds and nine assists, just missing out on his second triple-double as a member of the Lakers. Brandon Ingram scored 20 points for Los Angeles, who won for the third time in the past four games. Powered by their veteran backcourt, the Wolves got 31 points from Derrick Rose and 24 from Jimmy Butler. Minnesota remained winless away from home at 0-7, and it dropped their fourth consecutive game overall. Leading by a point late in the game, the Lakers missed three shots with less than a minute to play, two on three-point attempts from James. Los Angeles kept the possession alive with offensive rebounds, and Kuzma eventually hit one free throw for a 112-110 lead with 9.2 seconds remaining. The Wolves had one last possession, but Rose missed a wide-open three-pointer with four seconds to go. It was just the second miss in nine three-point attempts for Rose, who had a 50-point game October 31 against the Utah Jazz. The Timberwolves, who entered 19th in the NBA in three-pointers made at 10.3 per game, went 20-for-40 from beyond the arc. The 20 made three-balls set a Minnesota franchise record. Tyson Chandler made his Lakers debut in the first quarter and scored his first basket with his new team when he tipped in a Rajon Rondo miss with 5:09 remaining in the second quarter. He finished with two points and nine rebounds in 22 minutes. Chandler's contract was bought out by the Phoenix Suns on Sunday, and he signed with the Lakers on Tuesday. Andrew Wiggins had 19 points for the Wolves, while Taj Gibson had 16 points and 11 rebounds. Karl-Anthony Towns contributed 13 points and nine boards. Towns was held to 5-of-16 shooting from the field, in part due to Chandler's defense. Is this the dunk of the season?